Wellness for Cancer is a spa for people living with cancer. Social media connects people with cancer. But it can also be factually unreliable and unsupportive. Exposure to natural light or bright light therapy can lead to well-needed rest among people with cancer. Kadcyla reduces the risk of breast cancer recurring and spreading after surgery. Women who had breast-conserving surgery rather than mastectomy report better quality of life. The cancer death rate dropped by 27 percent over 25 years. Chelsea Dawson, an eight-year melanoma survivor, lives with her family in Roanoke, Virginia. Cancer and its treatment can lead to changes that affect sexual desire and function. Brain fog can have many causes including cancer itself and different types of treatment. 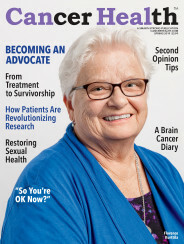 Ann Partridge, MD, MPH, is director of the Adult Survivorship Program at the Dana-Farber Cancer Institute in Boston. Here are eight second opinion tips. Diagnosed with early-stage breast cancer in 2016 at age 29, Jen Hodson turned to social media to cope.